In "The Center of Everything," Nero and Ruby talk about the Seven Wonders of the World. These Barre City fifth graders came up with their own Seven Wonders of Barre, projected here. She makes a special twelfth birthday wish that she could go back and listen to what Gigi had to say. And deep down, Ruby also wishes she could be back up on the roof of Pepperdine Motors, in the circle of Gigi’s hug, looking out at the stars. Barre City fifth graders in Cathy Blake's reading class have some moments they wish they could relive too, from trips to Florida, to stargazing with their own family members. 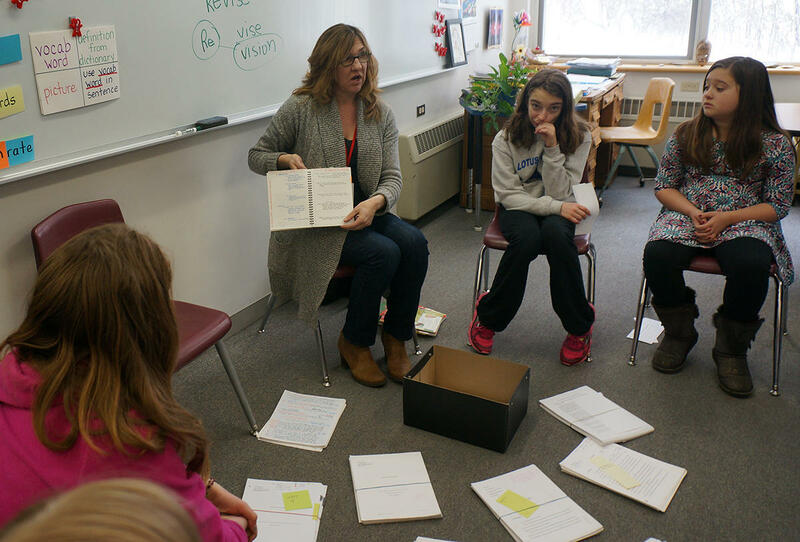 They shared these special moments when author Linda Urban recently visited their classroom. Barre City fifth grader Emily Morris put the same question to the author. Emily Morris: What is the moment that you would want to relive if you had the choice? Linda Urban: I have been listening all of your moments, and so many of them are about family connections or about something that was really exciting and out of the ordinary for you, and these moments really stand out. The moment I’d want to relive most isn’t really fair to my son, because he wasn’t around yet. But I think the birth of my daughter was a pretty amazing moment. It was me and my husband and then this beautiful, amazing, tiny baby that I made. It was really a great moment. Eleanor Steinman: What inspired you to write The Center of Everything? Author Linda Urban shares some of the many drafts she wrote of "The Center of Everything." It was a whole year later, at the Montpelier Fourth of July parade, when Linda Urban noticed something else that eventually brought her back to that writing exercise. Linda Urban: And I was standing there looking at this little girl in front of me and she had sweaty curls. And she was so eager for this parade to start. And I thought, “What is she so excited about? What could it be that she wants to have happen?” And then what happens to writers happened. I thought, “What if…” What if there was something that she needed or wanted? Or what if she had made a wish and she thought that wish might come true and it has something to do with the parade? I never put those two moments together, or at least I didn’t for weeks and weeks. I just kept writing about parades and wondering what she was thinking about. And then somewhere, down the line in the writing process, in one of these notebooks, the two came together. And that’s when I believed that I actually had a story to tell. Cadence Stevens: How did you come up with Nero’s personality and his big question asking thing? Linda Urban: Sometimes, often actually, when I write I just start writing and the words and the characters show up. And Nero was a gift. He just showed up, started asking questions, started being his inquisitive, turn-the-world-on-its-head self. And I thought that that was actually really useful as a counterpoint to Ruby, who so wants the world to be predictable – who wants to know what the rules are so she can follow them, so things can work out okay. And it was really useful to have a sympathetic, nice, funny character who doesn’t see the world that way at all, so that Ruby’s eyes can be opened. Kyle Coache: I was wondering what made you think of the characters’ names like Ruby and Nero and Lucy. 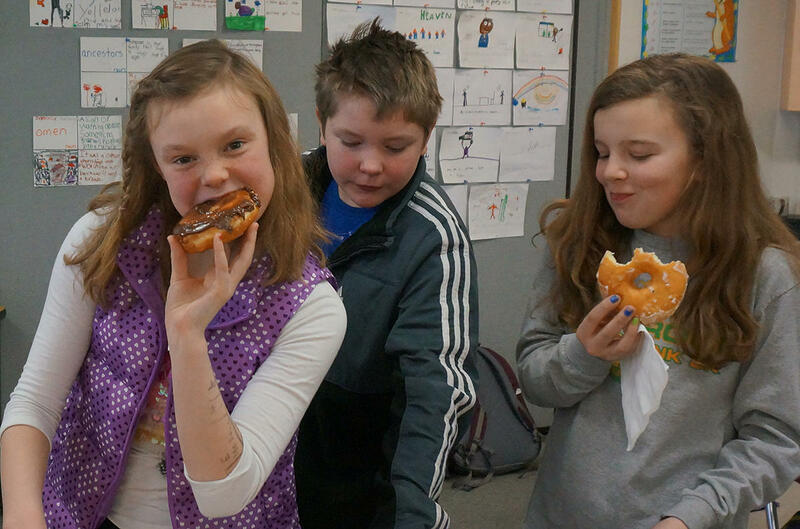 Donuts also play a big role in "The Center of Everything" and these Barry City readers got to enjoy some donuts of their own after their discussion with Linda Urban. Linda Urban: Thanks, Kyle. Sometimes my characters have very meaningful names. Like in my first book, A Crooked Kind of Perfect, for example, there was a character named Colton Shell. And the girl who gets to know him only gets to know his outsides. And so the “Shell” part of that was really important to me. Sometimes, though, I just like the way names sound. And I think saying “Ruby Pepperdine” is fun to say. Nero, poor Nero DeNiro, what a name, huh? He does not like that name. And you’ll notice his older siblings all have “D” names, right? Like Denise. In my head, Nero was named by his siblings. That they were all tired of “D” names and they named him something else, and he got stuck with Nero. Often, I choose names for how they sound and for how I think the character would respond to them. And I love Nero’s frustration with his name, and how that gets him to be a questioner. The kind of kid that he is. Jacob Lamphere: Ruby talks a lot about destiny. Why is so much of your book about destiny? Linda Urban: Wow, that is a big question. Because it’s one I ask all the time and I asked when I was your age too, right? I wanted to know, if I followed the rules, would things be okay? I wanted to know if my choices made a difference ... And one of the reasons that I wrote this book is because I think that a lot of adults don’t give you guys – your age – credit for having these thoughts. I think many people don’t remember their childhood very well. And they think childhood was all roses and Santa Claus and happy-go-lucky things, and they forget that when we’re 10, 11, 12, 13, 14 we are asking big questions about how the world works and what our place is in it. And how we’re connected or not connected to the people around us. And I wanted this book to explore those things. And your questions are really leading us in that direction too. They tell me that you’re thinking these things. Next month on Dorothy’s List, Prisoner 88 by Leah Pileggi. Dorothy’s List is sponsored by the VPR Journalism Fund.